A group of Chilean miners who were trapped in the bowels of the earth found spiritual inspiration Sunday atop the Judean desert summit of Masada. Three months after their rescue in October from the very bowels of the earth, more than two dozen Chilean miners traveled on Sunday to a mountaintop to view one of Judaism's sources of inspiration: the windswept Judean desert fortress of Masada. 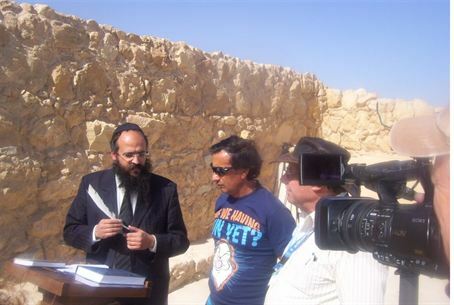 Arriving at midday, when the sun was brightest in the sky, the miners were greeted at the site by park director Eitan Campbell and the Rabbi of Masada, Chabad-Lubavitch emissary Rabbi Shimon Elharar. “I was very moved to be able to meet these people, who actually had been buried alive,” Elharar told Israel National News in an exclusive interview. “The entire world was witness to their story, and now suddenly we are privileged to see this walking miracle before our very eyes. Elharar presented Raul Bustos, leader of the group, with a special memento of the occasion – one of the quills with which the Scribe of Masada, Rabbi Shai Abramovich, has been writing a Torah scroll in his special chamber in the ancient synagogue. "We use the Torah as our spiritual strength, and our inspiration," explained Elharar. "It is our hope that this instrument, used to write the scroll in which the seven Biblical Noahide commandments aimed at all humankind are contained, will provide similar strength and inspiration for these men." The miners said the item would be displayed in a special museum exhibit of their visit to the Holy Land. The museum, which is to commemorate the miners' two-month ordeal, is currently under construction in Chile. Israel's Ministry of Tourism sponsored the miners' “Pilgrimage of Thanks,” which began Feb. 23. The tour is expected to extend to March 2. Although numerous religious sites throughout the country are on the itinerary, In order to avoid triggering any trauma connected with having spent more than two months underground, no tunnels or caves were included. The men were trapped after an August 5, 2010 cave-in at the San Jose copper-gold mine left them buried alive 700 meters (2,300 feet) underground for 69 days. Although Chile has officially recognized the Palestinian Authority as an independent country, the visit is non-political. It is considered private and was not officially arranged between governments, according to a spokesperson from the Tourism Ministry.